Name of the guest visiting your site. Names of those attending your wedding. Number attending as many as three different receptions. Offer your guests a choice for their dinner. Share a description of each meal option. Allow your guests to send comments with their response. Ask for the e-mail address of the guest who is responding. Creating your Online RSVP is just like choosing what to put on your reply card. Your guests will appreciate the option of responding instantaneously online without having to drop a card in the mail. Not to mention, you will receive an e-mail with each response. The e-mail will detail the response for you and add up the total number of people attending your wedding ceremony, receptions, and which meals they have chosen. 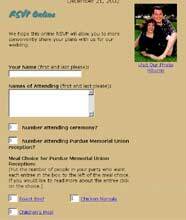 You can see an Example of an e-mail response that was sent through a couple's wedding website. This is what the e-mail you receive will look like to inform you of your guests response to your invitation. Questions about the Online RSVP? Send your comments, questions, and suggestions to: Support@Bwedd.com. The definition of RSVP is very hard to find. That is because RSVP is a French acronym - repondez s'il vous plait - and literally means "Please Reply".